Prince Alexander Danilovich Menshikov (Russian: Алекса́ндр Дани́лович Ме́ншиков) (16 November [O.S. 6 November] 1673, Moscow – 23 November [O.S. 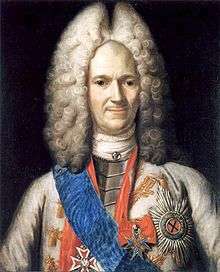 12 November] 1729, Berezov) was a Russian statesman, whose official titles included Generalissimus, Prince of the Russian Empire and Duke of Izhora (Duke of Ingria), Prince of the Holy Roman Empire, Duke of Cosel. A highly appreciated associate and friend of Tsar Peter the Great, he was the de facto ruler of Russia for two years. Menshikov was born on 16 November [O.S. 6 November] 1673 in Moscow. It has been disputed by his enemies whether his father was a stablehand or worked on a barge; it is more likely that he was of petty noble stock. As the story goes, he was making a living on the streets of Moscow as a vendor of stuffed buns known as pirozhki at the age of twenty. His fine appearance and witty character caught the attention of Franz Lefort, Peter's first favorite, who took him into his service and finally transferred him to the tsar. 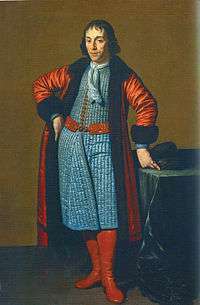 On the death of Lefort in 1699, Menshikov succeeded him as Peter's prime favorite and confidant. He now aimed at establishing himself definitely by marrying his daughter Mary to Peter II. But the old nobility, represented by the Dolgorukovs and the Galitzines, united to overthrow him, and he was deprived of all his dignities and offices and expelled from the capital (20 September [O.S. 9 September] 1727). Subsequently he was deprived of his enormous wealth, stripped of the titles, and he and his whole family were banished to Beryozovo in Siberia, where he died on 23 November [O.S. 12 November] 1729. His wife Darya Mikhailovna died on their way into exile in 1728 near Kazan. According to Simon Sebag Montefiore in his book "The Romanovs 1613-1918" Menshikov was once punched twice by Tsar Peter the Great, once in the nose and once on the side of the head, after Tsar Peter saw Menshikov dancing with his sword still on, considered highly rude and offensive. In Beryozovo Menshikov built a wooden church. He buried his daughter who died in exile there. 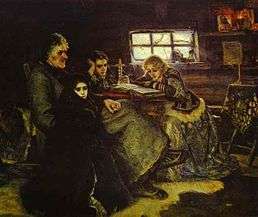 Menshikov's younger children survived the exile and were eventually returned to the court. 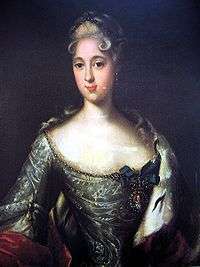 Princess Maria Alexandrovna (26 December 1711 - 1729) engaged to Grand Duke Peter of Russia and died of smallpox in exile. Princess Alexandra Alexandrovna (17 December 1712 - 13 September 1736) married Gustav von Biron, brother of Ernst Johann von Biron, and died in childbirth. Prince Alexander Alexandrovich, Duke of Ingria (March 1714 - 27 November 1764) engaged to Grand Duchess Natalia Alexeyevna but eventually married Princess Yelizaveta Petrovna Golitsyna and had issue. ↑ "Library and Archive". Royal Society. Retrieved 2012-08-06. ↑ "Menschikow und Stalin waren die einzigen Heerführer der russischen Geschichte, die sich „Generalissimus" nennen ließen." [Menshikov and Stalin were the only military leaders in Russian history who declared themselves 'generalissimus.'] Jena, Detlev (1996): Die russischen Zaren in Lebensbildern, Graz, p. 520.